Eleven semi-finalists were revealed on tonight’s show: Michael Simeon, Loren Lott, Adam Ezegelian, Lovey James, Adanna Duru, Clark Beckham, Daniel Seavey, Tyanna Jones, Rayvon Owen, Shannon Berthiaume, and Jax. Above is the number of positive versus negative tweets posted about these contestants tonight. I wouldn’t worry about Clark at this point. 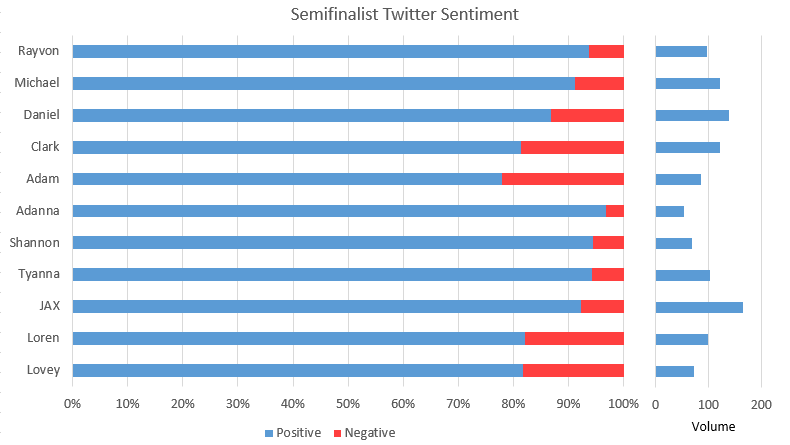 At 60% overall sentiment, and almost 20% negative tweets, I’m not sure the judges made the right pick. Adanna Daru was much more popular, but still seems to suffer from a low number of people talking about her.